Looking for a fresh and holistic take on self-care? 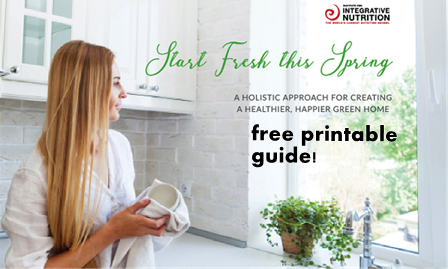 Get the new Spring Cleaning Guide from Institute for Integrative Nutrition. Cleanse your home using ingredients right from your pantry. Balance the energy flow in your home to nourish your mind and soul. My favorite part of the guide is "5 ways to use house plants to enhance your quality of life." I knew plants are useful for cleaning the air of toxins, but I was surprised to learn that plants increase dopamine production in the brain, which contributes to feelings of happiness, enhanced cognitive ability, and even heightened creativity. Leave a comment and let me know if you feel a connection between your home and your personal well-being.